Tag line: "She had to kill the thing her husband had become -- But could she?" I was already a fan of David Cronenberg’s 1986 remake of The Fly before I ever sat down to watch the '58 original, and while the two movies approach the story differently, both have earned a place among the classics of the sci-fi/horror genres. Scientist Andre Delambre (Al Hedison) has just been crushed to death in a hydraulic press. His wife, Helene (Patricia Owens), confesses to murdering him, but as she tells Andre’s brother, Francois (Vincent Price), she had her reasons for doing so. It all started with an experiment Andre was conducting, in which he transported living creatures from one sealed chamber to another using his newest invention, the “disintegrator-integrator". Following several successful attempts with animals, Andre decided to give his creation the ultimate test, and climbed into the chamber himself. 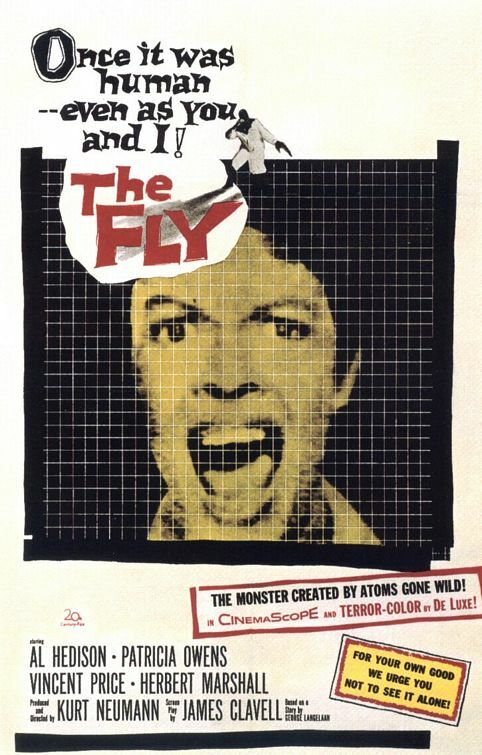 Unfortunately, he wasn’t alone; a fly had entered with him, and when Andre transported himself, he and the fly inadvertently swapped atoms, leaving Andre with the head and left arm of an insect! His mental capacity slowly slipping away, Andre begged Helene to end his misery. Initially, neither Francois nor Police Inspector Charas (Herbert Marshall) believe her story, but quickly change their tune when they themselves make a startling discovery. Both versions of The Fly, this one and Cronenberg’s remake, deal with the physical transformation of a man into an insect. Where the two films differ is in the way they handle the fly itself. In Cronenberg’s The Fly, Scientist Seth Brundle (Jeff Goldblum, delivering an incredible performance) accidentally merges his DNA with that of a common housefly, leading to disaster when the two become one. In the 1958 original, Delambre and the fly trade body parts with each other, yet remain separate entities. To correct his mistake, Delambre must find the fly so that he can reverse the process. Of course, doing so won't be easy; in fact, It's probably more difficult than finding a needle in a haystack (at least you have a general idea where the needle is; this damn fly could be anywhere). Every now and then, we see the insect buzzing around, and the tension mounts as the characters come close to discovering it, yet continually fail to do so. The search for the elusive fly introduces a different, and equally engaging, element to the story, adding a level of suspense that, at times, is downright unbearable.